Scottish Secretary Michael Moore is asking the First Minister to meet him in Edinburgh this week for talks on the independence referendum. The UK Government wants to provide Holyrood with the legal powers for a fair and decisive referendum. Michael Moore has already spoken to Mr Salmond proposing talks and will write suggesting a specific time and place - Thursday in Edinburgh - to try and get things moving. 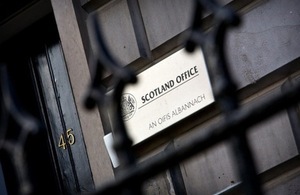 The UK Government made clear yesterday that they are happy to engage with the Scottish Government at all levels but that the first contact should be with the Scottish Secretary who is leading the referendum consultation. Moore also said that he and his Ministerial colleagues will be out in Scotland this week listening to what people think about his referendum plans as well as making the case for Scotland remaining in the UK. Other UK ministers from Defra, BIS and the Foreign Office are due to be in Scotland over the next week and will help with this effort. Moore will be addressing the CBI in Edinburgh on Monday and the Advocate General will be setting out the legal situation with the referendum at Glasgow University on Friday. ‘Since Tuesday, when I set out our plans for how Scotland can hold a legal referendum, I have spoken to the First Minister and asked him to meet for talks. I have also written to him. ‘I was pleased to hear him yesterday suggest talks with the UK Government and I want us to meet in Edinburgh this week to start making progress. We want this referendum made in Scotland and we should start the work this week in the nation’s Capital. ‘There are real legal problems that need solved and I hope we all share the desire to have a legal, fair and decisive referendum. We should not waste any more time talking about talks. Let’s get round the same table and get cracking with the arrangements for the most important decision Scotland will ever make.